When I think of Santorini, images of neon sunsets, whitewashed homes perched high on cliffs and fresh Greek food start jumping around my head. I'm taken back to our first trip on the island and I can just smell the grilled fresh fish and chicken souvlaki, my mind instantly goes into slow motion as I see chefs cut fresh tomatoes and the tomato juice squirts out. I see wine being twirled in wine glasses as i’m running through narrow streets in a long flowy dress, trying to catch the sunset. This is how I think of Santorini, how I experienced it years ago, and what it felt like when we first went to the island...sans baby. Traveling back with our 9 month old son, was a bit of a different experience. The fresh food was still there, the magical sunsets could still be seen but the addition of a 20 pound baby and a stroller, changed our style a bit. We had no desire to be nestled in the throngs of people that hoard Oia, and frankly we couldn't - the majority of hotels in Oia wont allow kids because they’re perched on the cliffs and it’s a bit dangerous. So we set out to find a place that would give us the wellness and beauty we craved, and could handle our son and stroller. That’s when I came across Andronis Concept, a beautiful modern hotel, overlooking the Caldera in the heart of Imerovigli. Set against the backdrop of the Caldera, in the beautiful town of Imerovigli is Andronis Concept, a hotel that caters to families, yet keeps the focus on adults, through its wellness activities and stunningly modern decor. As we drove up the long driveway to the property, we saw fresh gardens being planted and an infinity pool that went the length of the property - a very rare thing to see in Santorini. But best of all, there was flat land! Yes we could get around with Axel and his stroller without having to navigate narrow and steep steps. After the usual check in formalities, we were lead through open air corridors, with walls that must have been over 20 feet, a beautiful architectural details that seemed to go on forever. Our room was at the end of a corridor and felt as if it was built into a cave, an ode to Greek architecture no doubt. The room was nice but it was the view and our own private pool that stole the show. The room itself was a blur of white cozy linens and crisp clean lines, with a glass sliding door leading to our terrace. Our own infinity plunge pool was waiting with direct views over the Caldera. In the distance was Oia and directly in front of us was blue ocean as far as we could see I think we might have had the best view in all of Santorini! Dining at Andronis is delicious! As you’d expect from a top-rated hotel like this — the food is locally sourced, fresh, etc. etc. etc. but the true beauty of their food is that it’s healthy and just feels good as you eat it. For breakfast we could be found at Throubi, their main restaurant, where we started our days with avocado toast and fresh smoothies. The chef even prepared a pureed sampler of avocado and sweet potatoes for Axel. Lunch time was always relaxed and long, as we would all sit by the pool and just nibble on fresh salads and the best baked fries. Now dinner at Throubi, was special and called for a babysitter :) Through the hotel, we were able to coordinate a professional babysitter to come watch Axel, so that we could get some alone time. The restaurant is set on the Caldera side of the property, making this one of the best restaurants to see the sunset, in a totally relaxed environment. Sitting outside, under the stars, and feasting on modern Mediterranean dishes and washing it all down with Greek wine, brought Chris and I back to the Santorini we loved. I think we found our favorite spot in Santorini! We did force ourselves, to get out one night and try another restaurant. So with Axel playing in the room with his new favorite sitter, we took the shuttle to Oia to walk around a bit and try Catch, a new restaurant in town. Although Catch is in Oia, it’s set back a bit, so you’ll be away from all the crowds and tourists. They have a fabulous rooftop area (great for catching sunsets) and a beautiful terrace with live music. We must have spent several hours at the restaurant, just relaxing and taking everything in. We had dinner on the rooftop and ended the night with some craft cocktails in the bar area. 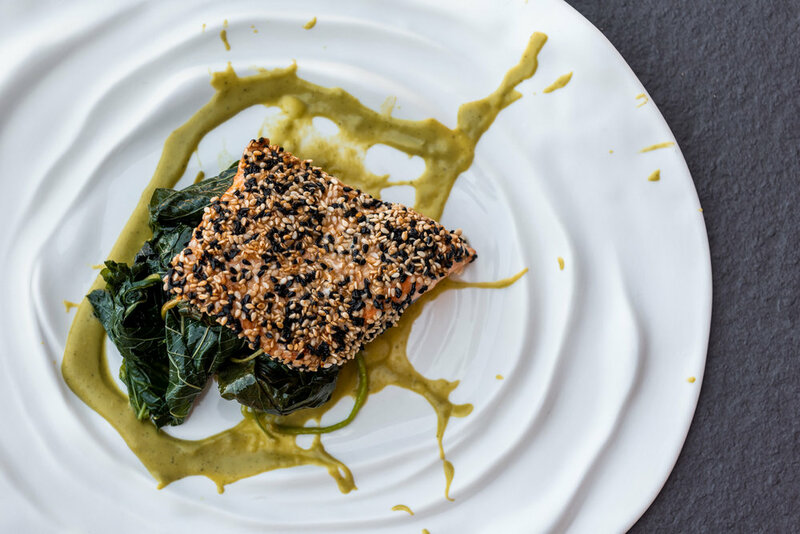 The menu does change frequently based on what's locally available, but you can always expect top quality produce, presented beautifully! To be frank, we could have easily spent our entire trip, hidden away at the hotel...but Santorini is just too beautiful not to explore, so we decided to get out a bit. We took a private tour (organized by the hotel) which took us all around the island. Our tour guide/driver had a few places in mind but changed things up a bit when we told him we wanted to photograph Santorini and see some unknown places. We visited some towns like Finikia and Megalochori but the best part was just being able to stop whenever we saw something we liked - I highly recommend doing this! If you’re looking to stay close to the hotel, you can easily reach Oia in about 15 min by car and the hotel offers a free shuttle - so definitely take advantage! You can also walk on the hiking path towards Imerovigli and take in all the beautiful whitewashed buildings and countless steps. Head out before sunset and enjoy the sunset as you walk along the cliffside! 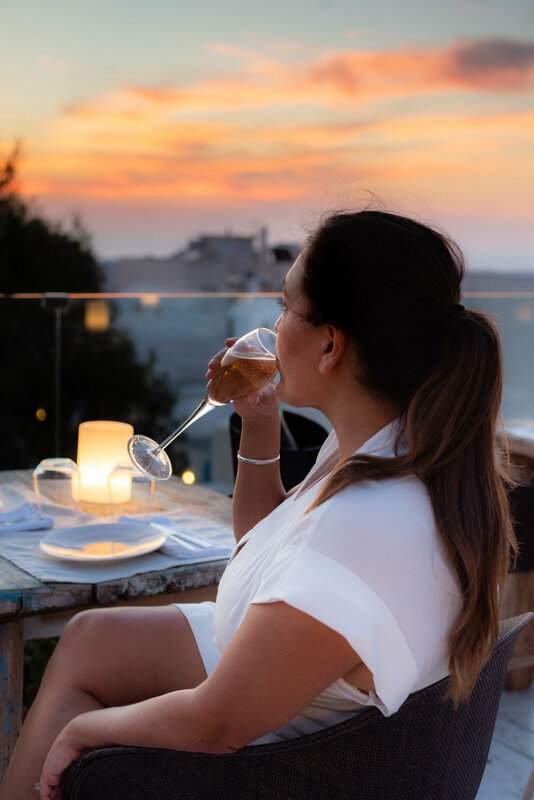 I thought I would be sacrificing my perfect Santorini getaway by staying outside of the main towns and bringing a baby, but I soon realized that I was falling in love with the peace and quiet and slower pace of life at Andronis Concept. All of us can’t wait to come back to this hotel. Axel was most excited about our private pool, Chris loved the wine options we had (and the pool) and I loved how private the entire experience felt! It’s a great place to visit as a family or a couple!